The Gold American Eagle proof coin is one of the most beautiful coins struck by the United States Mint on an annual basis. For most production years, the 1 oz coin was the most popular in the series, regardless of version (bullion, proof, or uncirculated). Today, a 1990-W 1 oz Proof Gold American Eagle coin is available from Silver.com in perfect condition. Ships in a PCGS plastic slab for protection. Consists of one ounce of .999 fine gold. Issued a face value of $50 (USD) backed by the US government. Graded a perfect Proof 70 by the Professional Coin Grading Service. Struck with a Deep-cameo finish. Gold American Eagle coins were first struck in 1986. Originally, the series consisted of bullion and proof versions. Although the bullion program featured four different weights, 1 oz, ½ oz, ¼ oz, and 1/10 oz, those weights were not struck in the proof series until 1988. 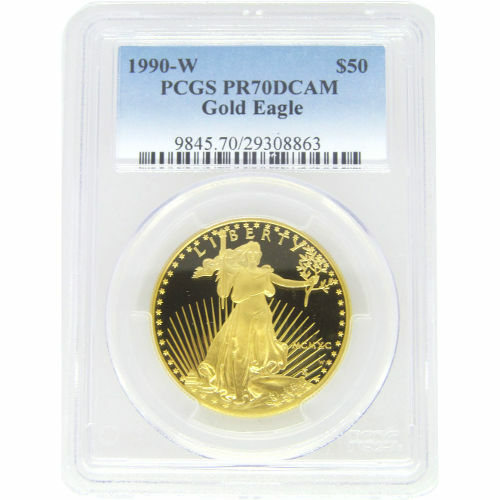 Each of the Gold American Eagles in this product listing is available with a PR70 grade from the PCGS. Perfect proof coins have their full, original luster, and no blemishes, contact marks, hairlines, or detracting flaws. Deep-cameo coins are characterized by a strong, frosted finish on the design set and a deeply-mirrored, clear background field. The obverse side of Gold American Eagle coins features Augustus Saint-Gaudens’ iconic Lady Liberty image. In his depiction, Liberty is striding confidently forward from the setting sun with a torch held aloft in her right hand as a guiding light. On the reverse, Miley Busiek’s family of nesting bald eagles was created specifically for use on the Gold American Eagle. Engravings on this side of the coin include the weight, purity, metal content, and face value. Gold American Eagle coins are struck by the United States Mint at various facilities. All 1 oz Proof Gold American Eagles are struck by the West Point Mint, with fractional weight coins and bullion coins struck by other facilities. If you have questions about these coins, please contact a Silver.com associate at 888-989-7223. We’re also available online through our live chat and email services. 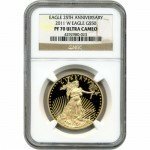 If you are looking for similar products, be sure to check out our collection of Gold American Eagles.